Bled, the most popular tourist destination in Slovenia, attracts millions of visitors. It’s easy to understand why: the alpine lake with crystal clear water, a small fairytale-like island, and a mighty castle on the cliff with breathtaking views. But for local Slovenians, there’s another draw for Sunday trips to the often overcrowded and pricey Bled: a sweet and creamy treat called kremna rezina. 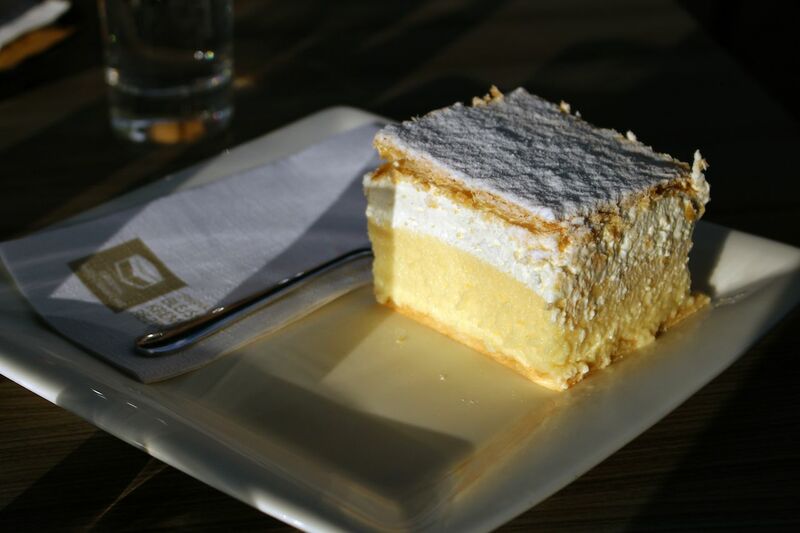 Kremna rezina is one of the most popular Slovenian desserts. It’s made with a golden buttery crispy crust, vanilla cream, whipped cream, and another crispy layer of buttery dough that’s all dusted with a rich layer of sugar icing. You can find it in cafes around the country, but the best kremna rezina is made in one place: Hotel Park in Bled. A version of the cream cake dates back to the Austro-Hungarian Empire in the 1700s. Bosnia, Poland, and Slovakia all have versions, as well. No one does it quite like Lake Bled, however, and it’s all thanks to a chef at Hotel Park. Kremna rezina became a symbol of Bled gastronomy in 1953 after chef Ištvan Lukačević moved with his family from Serbia to Slovenia. He became the head of hotel’s patisserie where he started to experiment with an old Vojvodina recipe. After several attempts and variations he landed on the current recipe for kremna rezina (or kremšnita as the locals know it). The dessert rapidly became a draw for people in the surrounding area. In the 1970s, the hotel once made 6,000 in a single day. Today, around 3,000 are sold every day at Park Hotel and 6,000 are shipped to Austria every week. When the dessert celebrated its 60th anniversary, Hotel Park released some numbers on just how popular its dessert is. More than 14 million pieces have been sold, enough to form a six-meter cake wall around the entirety of Lake Bled or stretch end to end from the Park Hotel to Rome like some sort of yellow cake road. The hotel uses the same recipe, ingredients, and process despite new appliances that would make the job easier. The women in the patisserie still knead the butter dough by hand and fold it seven times, the egg cream is still left to boil exactly seven minutes, the flour is still being imported from Serbia (the Slovenian one is said to be unsuitable because the air there is more humid), and each piece is still cut into a square that’s exactly seven centimeters long, wide, and tall. The dessert is always served fresh, and you’ll never be offered one made the day before. It takes months of experience to make it perfect, and young confectioners have a lot of problems getting it right. One testament to Park Hotel’s supremacy is that when Hotel Park’s chefs make kremna rezina abroad, they bring all the ingredients with them rather than sourcing on site. This can all be lost on visitors. Bled has been considered one of the most beautiful European mountain resorts for centuries. 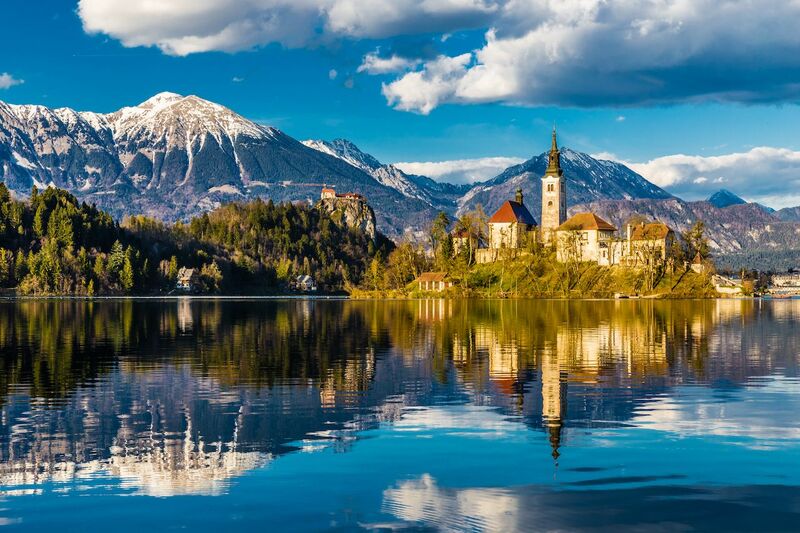 Modern tourism started with Slovenian independence in 1991 and then opened up even more when the two-million-person country was admitted into the European Union in 2004. Bled transformed into a tourist destination for people around the world — especially for the Instagram types. The 8,000-person town has over 15,000 followers on Instagram and another 25,000 followers on the town’s lake Instagram account. People go for the Julian Alps, pure alpine air, and the oldest (and most picturesque) Slovenian castle. They go for lake rides on traditional wooden flat bottom boats and for romantic weddings. But too often, they don’t even know they’re missing out on the famous cake. As no trip to Bled is complete without kremna rezina, you don’t even necessarily have to visit Hotel Park if it’s out of reach. It’s also sold in several other hotels in Bled and even in the Nebotičnik café in the capital, Ljubljana. To make sure you’re tasting one that’s properly made, it has to pass the two-step test: When gently shaken, it has to swing, and when you stab a fork into the crust, it has to make a pop. Once it’s passed the test, all that’s left is to enjoy.